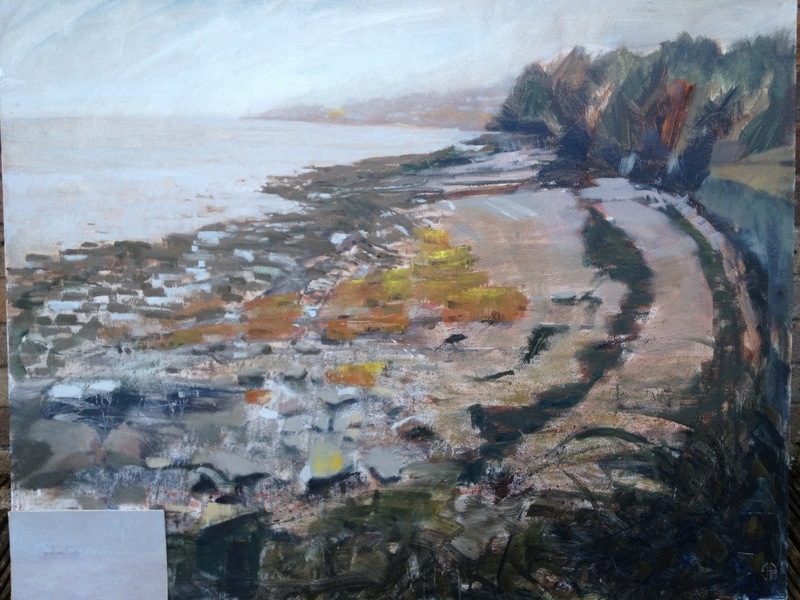 Here’s a four foot wide painting of Kilkenny bay in Portishead I’ve recently completed for NSAW (only 12 days to go). I’ve spent the evening framing it in a sea weathered garden gate frame I beachcombed, complete with a rusty bolt, it’s been in the basement with this in mind for at least four years, it makes it a whopping 5 feet wide. I think it suits it though, you’ll have to come and visit to judge for yourself. In the bottom left is a misty little cargo ship I painted on a small board too. The large painting was certainly more fun, lots of splashing turps around outside and chasing dribbles. Hopefully I’ll get time to do another, I’ll need a wet paint sign. This entry was posted in exhibiting and tagged coast, landscape, oil painting, Seascape by ianpriceart. Bookmark the permalink.